Sweeten with Honey or Maple Syrup to taste. I don't drink milk, so I used 2 Tblspn Soy Milk Powder [I'm out of Almond Milk], but alternatively, you can use 1 cup per serving of whatever milk you prefer. My blender has a heating function, so this would be the part where I stick all the ingredients into the nutribullet and let it do it's thing. Howver, the traditional way to do this, is to mix all the ingredients in a pot on the stove and stir till completely mixed and warm. then whisk for a little froth, and pour. 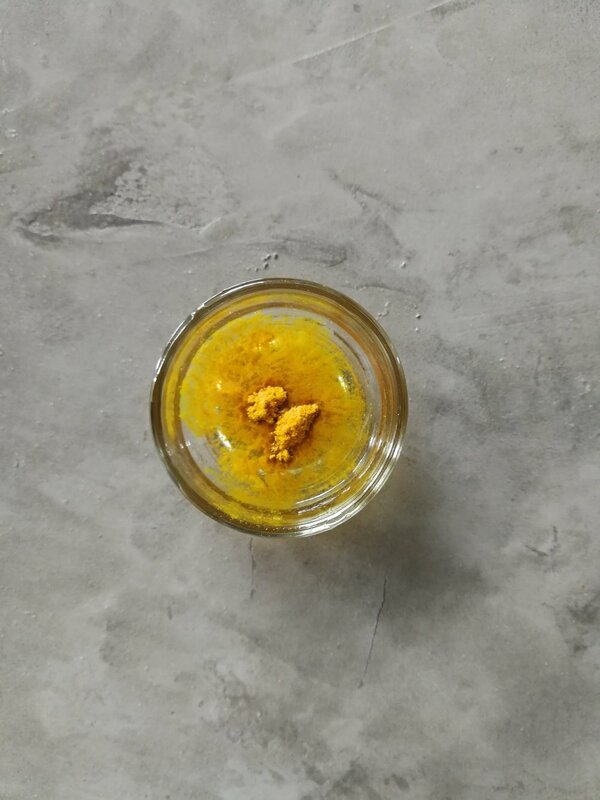 Unlike some of the other natural teeth whitening ingredients, turmeric offers the benefit of not damaging the enamel while whitening the teeth. Salt is abrasive, so even while it’s cleaning it is removing some of the natural layers of enamel at the same time. You can end up with some sensitivity issues after using it. Lemon juice has higher acidic levels than some other natural ingredients. It will start to wear away the enamel, as well as lifting up the stains. If you use apple cider vinegar, you will have a similar problem. So, it’s normal to worry about the damage you could be doing to your teeth. When using turmeric, you don’t need to worry about this potential damage. It doesn’t rub and doesn’t leave an acidic pH in your mouth. You can place it straight onto the teeth and know that you are cleansing and not leaving particles behind. It’s very similar to the way that baking soda will work! It takes about a week for the turmeric to work fully. If you use it twice a day for that whole week, you should start to see some results. Turmeric is full of health benefits. It strengthens the hair, improves the look of the skin, and is beneficial for the mental health. There are also plenty of oral health benefits. This is a spice that has been used for centuries for helping to improve the health. Studies have shown that the health claims are true, especially when it comes to the oral health. One of the biggest benefits is to the health of the gums. Turmeric helps to reduce inflammation and swelling. Inflammation usually happens because the body is fighting against something or the gums have been irritated. The problem is that swollen gums pull away from the teeth and leave gaps for more bacterial to get in and grow. The bacteria lead to gum disease, which leads to more swelling and inflammation. The turmeric can help prevent the inflammation, which can reduce the area for bacteria to hide and grow. This can also help to prevent receding gums, which causes the roots of the teeth to be exposed and leads to tooth decay. Receding gums is a problem with a lot of teeth whiteners, both chemical and natural. You don’t have to worry about any of that with this option. I use an organic virgin coconut oil for cooking and DIY beauty treatments. This makes a nice alternative to water for this recipe, and adds shine to your teeth. With the turmeric and oil working together, you create an antibacterial, antifungal, and anti-inflammatory paste. Not only are you removing the stains, but you’re also removing and killing bacteria, stopping gum disease, and reducing the risk of tooth decay in the future. I gently melt it in the microwave before adding the Turmeric, to ensure the two mix together thoroughly. Mix it all thoroughly and stick it in the fridge for a few minutes so it return so a solid and can be mushed into a paste. 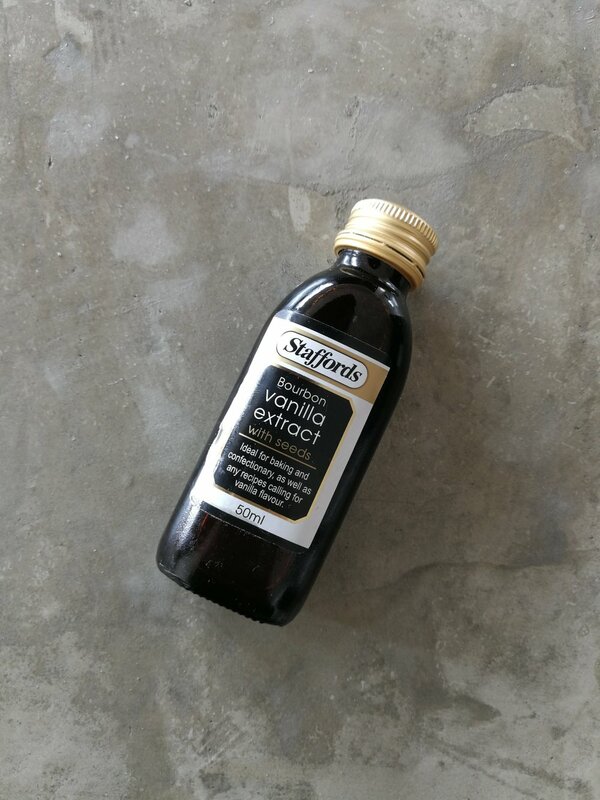 Once your oil has solidified again, mix it up into a soft paste. Brush your teeth with the paste as you would with toothpaste. Leave to sit for 5 minutes before rinsing. Brush teeth with baking soda or normal toothpaste afterwards to remove oil. Twice a day for two weeks should reveal a brighter smile. Turmeric is very high pigment and stains easiliy. to remove any yellow staining from your sink or toothbrush, use a baking soda and white vinegar/apple cider vinegar mix to clean. This is a 'whatever you have leftover' type recipe. You can literally throw in anything you like to make the curry of your convenient dreams. 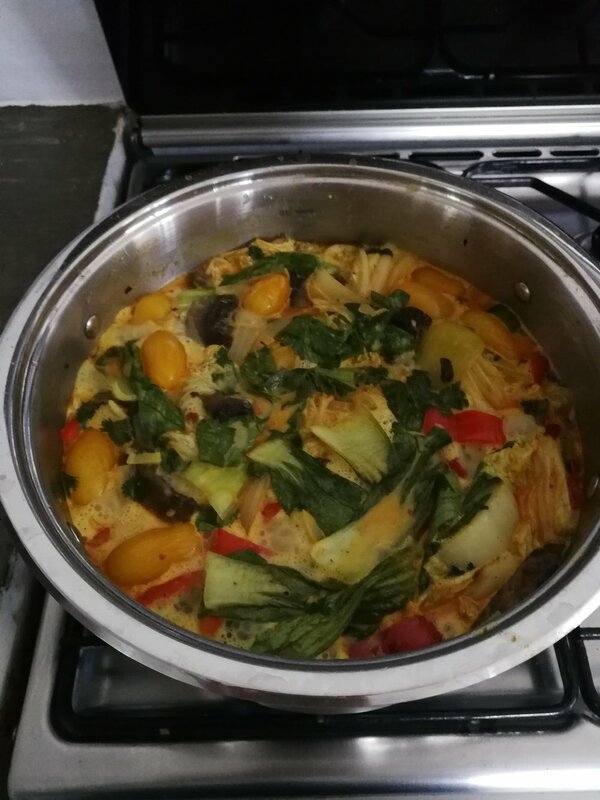 I used, baby Pak Choi, some sliced Mushrooms, 1 chopped White Onion, Zucchini chunks, Red Pepper chunks, Yellow Baby Tomatoes, chopped Baby Corn and some roughly chopped Chinese Cabbage. Carrots work well in these curries, and so do sweet potato, but really you can use anything. Start by frying up your Onions and garlic in Olive Oil. Add some Turmeric and Chilli, Salt and some Pepper. when the onions are clear, add the rest of your veggies. Let them fry up and develop some flavour before you add in the curry paste. Fry that up fro a few minutes, and then add in you coconut cream. Let that simmer. Add in half your stock, and continue simmering. If you were just making a curry, this wold be the right consistency, but this time I made a curry soup, because it's so cold out, so I added the coconut milk and the rest of the stock, a few drops of soy sauce, and this is where the fish sauce goes in, 2 tspns. Let simmer for about 15 mins, and voila. Add your Coriander just before turning off the heat. I served my Coconut Curry over some rice noodles, but you could use Rice, Egg Noodles or nothing at all as just a soup. Conventional fabric dyes are bad news. The runoff from fabric dye pollutes waterways, and the dyes themselves are not so healthy for workers who are around them day in and day out, either. Luckily, you don’t need harsh, chemical dyes to tint fabric in lovely colors! You can use natural, food-based ingredients like fruits, veggies, and herbs to create your own non-toxic fabric dye. If you’ve every cooked with turmeric, you know that it stains fabric like gangbusters. Heck, it even stains your hands, if you handle it too much. The property that calls for caution in the kitchen is your ally if you’re looking to dye fabric a cheery shade of yellow! Here’s how to make a batch of fabric dye from turmeric, water, and just one other ingredient that’s most likely already in your kitchen! In the same way you mixed the melted coconut oil with the Turmeric, this mixture can be used as a hair mask to treat dandruff. Brush it into your scalp and leave for 5 minutes, then wash as normal. Mix it all up. Add some melted Coconut Oil for extra moisture if you like, and leave in the fridge to cool for 15mins. Apply generously to your face with your hands. Leave for 10 mins, and wash as normal with a gentle face wash or soap. Once a week will provide brighter, softer skin!